We need to balance the Budget over the Business cycle as Keynes suggested, right? Firstly, we do need to ask if Keynes did suggest that. There are arguments either way on this point. Keynes’ view unfolded and developed starting in the bleak 1920’s in Britain. There was no “roaring twenties” for the UK economy as the government deflated the economy to try to fit the Pound back on to its pre war Gold Standard. Keynes then did argue that governments should run deficits if private spending declined and reduce those deficits when future growth was strong enough. This has been interpreted by many that his intent was that the budget was to be more or less balanced over the business cycle. If anyone is keen to research into his thinking they might like to start with his 1924 publication “A Tract on Monetary Reform”. A better approach might be to try to understand why Keynes should made a break from tradition and start to advocate that budgets should at times be unbalanced. If we consider an economy which is neither a net exporter nor a net importer and in which everyone spends what they earn within the economy, Government spending and taxation must balance. This is true regardless of the level of taxation imposed (providing it is finite) and so regardless of the level of inflation within the economy. It has to, according to the principle of sectoral balances originally developed in the 60’s and 70’s by the late Prof Wynne Godley at Cambridge University. If the participants of the economy don’t spend all they earn, ie when private spending declines, we can have a tendency to recession. Keynesian economists would point out that prices and wages tend to be “sticky” and so don’t respond quickly to changing circumstances as more classically minded economists suggest they should. Therefore, Keynes was quite right to suggest that the Government should spend more, or tax less, to prevent recession from occurring. The government needs to borrow money from the savers and spend it on their behalf. Later, when the savers withdraw their money from the bank, or empty their piggy banks, and spend it, the Government needs to run a surplus in its budget to prevent the economy from overheating and inflation occurring. So the budget does indeed end up balanced over the cycle. It ends up being an approximately symmetrical pattern when expressed graphically. This relatively simple model may have been adequate for the UK economy in the 1920s. However in recent times the extent of saving and desaving hasn’t been symmetrical over the business cycle. When times are good people may borrow and spend more but equally they may put more aside for their retirement. So if the spending/saving/borrowing pattern of the population isn’t symmetric over the business cycle, neither can we expect the government to run a balanced budget over the business cycle. Instead of imports and exports balancing, our economy has something like an annual 5% of GDP deficit in its current account. Our trading partners seem happy to supply more real things to us than we supply to them. They take our IOUs in the form of treasury bonds or gilts to make up the difference. In effect they are like a big net saver within the economy. As Keynes pointed out, if people are saving more, and that includes our trading partners, the Government has to be spending more or taxing less. The ‘balanced budget over the cycle’ is really just a special case which does not apply to our own 21st century economy. If we try to force the Government budget into balance, at the same time ignoring the trading position and the willingness or otherwise of the economy’s participants to net save then we are courting economic disaster. The budget will not balance, no matter how hard we try, and we will end up like a dog chasing its own tail as the economy spirals ever deeper into recession. Where does the Money come from in a Monopoly game? It has been some time since I last played Monopoly. The Board Game. As I remember we have several players and a banker who assumes a similar role to government in our economy. He hands out money at the start of the game. Whenever we pass GO, or draw a lucky card from the community chest we get a bit more. He charges us tax, super-tax, and might put us in jail from time to time. We don’t like it when that happens, but where does the money come from in a Monopoly game? The more right wing players might argue it comes from other players when they land on the their Mayfair or Park Lane properties which have houses and hotels on them! They like to think that wealth creates money rather than the reverse. But those of us who take a wider view know it all comes from the banker originally. The government/banker is always in debt. He has to be. His debts are the players’ monetary assets. Penny for penny. Would the game work at all if he insisted on always balancing his budget? PS Apologies if this is a statement of the bleeding obvious! But, many of our highly educated (over-educated?) politicians still seem to be in need of such. Do we really have austerity economics in the UK? Many right wing commentators make the point that public spending is higher now than under the last Labour Government in both real and nominal terms. They dispute the charge made against the present government by the left that they are engaging in the ‘austerity economics’. Even the deficit (they mean the government’s budget deficit) they will admit, when pushed, is higher than the last Labour government’s deficit. So why are we being so harsh when they are clearly doing their best? If we want austerity , they argue, just look at what happens in the Eurozone. Is there any justification for their defence? Possibly. GDP per person is just about the same as it was a decade ago. There were no accusations of austerity economics then and most voters in the UK felt fairly well off. Or, at least they did in sufficient numbers to re-elect a Labour Government in 2005. So, why is the general feeling that we are worse off now than we were then? If the published figures are correct, and there is no reason to dispute them as far as I know, then the problem must be one of distribution of the available income. Ironically, the best defence the Tories have against the charge of austerity economics is that there would be no austerity if everyone had a fairer share of what was available. They might not go for that though! GDP per person is now twice as high as it was when Mrs Thatcher first won a general election. She and her government were of the opinion that the left were reactionary in quibbling about the distribution of the proverbial cake, and that it was better for all if we just concentrated our efforts into making a bigger cake. Well, we’ve done that. The cake is now twice the size, but there are more homeless now than there were then, with higher levels of unemployment and underemployment. Terms like “Zero Hours Contracts” and “Food Banks”are in existence now which weren’t then. So why the problem? It has to be caused by how the available wealth and income is divided. There is no alternative explanation. So how does this work with the present bout of austerity in the UK? There are two problems here: Firstly he, I would suggest David Cameron and George Osborne too, thinks that reduction is a good thing. Secondly, he thinks the UK’s deficit is the same as the Govt’s budget deficit which it clearly isn’t. A better description of the UK’s deficit is the net loss of ££ to pay for the net import bill and which is currently some 5% of GDP. So, it must follow that if Government reduces its own deficit to below 5%, as it has recently done, that it is simply pushing the economy into recession. That’s austerity. Everyone will run increasingly short of money. Gross aggregate demand can then only be maintained by increased private sector borrowing which of course just inflates the bubble economy. London property is rated as the most overvalued in the world with a bubble index of 1.88 and the rest of SE England can’t be far behind. If the Government wants to run a a 5% deficit in trade it has to run something like a 7-8% deficit in its budget to allow those in the economy who wish to save (rather than borrow) some capacity to do so. Pushing it down to only 4% is a recipe for disaster. The economy is now hanging by a thread. The bubble will burst sooner rather than later and we all know what happens to real economies when bubble economies burst. Even looking at this kind of economics from a right wing perspective, I can’t see it makes any sense. Firstly it will reduce the electoral chances of the Tory Party. Voters who become economically disadvantaged and become reliant on State support will vote for parties offering better rather than worse support. Secondly, it will hinder their desire for a smaller state. That is only going to be possible when workers have sufficient spending power to afford private sector alternatives to those services the State now provides. Richard Murphy published an interesting article “On budget surpluses and the economic illiteracy of the Fiscal Charter” yesterday in which he made several important points such as “we need deficits because people want to buy gilts” and “if the government runs a surplus someone else has to run a deficit”. Absolutely right and well said, Richard! I hope everyone who’s even the slightest bit worried about our deficit and so-called “national debt” reads this very important piece of what will be ‘news’ to them. Maybe John McDonnell has finally seen the light? There’s nothing wrong with a a change of mind when new evidence and new arguments compel that. Intelligent people change their views all the time as more information becomes avaialble. The question to be resolved, and I must admit I’m not totally clear on the answer, is if we should sell gilts. Is the fact that people want to buy them a good enough reason to sell them? Why can’t we just allow people to put their money on deposit. Offer the a fixed interest rate, say 2%, and tell them “That’s it. Take it or leave it”. Some would say 2% was way too high. We should pay 0%. So what will happen then? If we discourage people saving, deliberately creating enough inflation to make 0% , or even 2% very unattractive, we’ll theoretically have no deficits at all. Is that what people really want? Is George Osborne aware that what he needs to do to achieve his surplus is create more inflation and stop selling gilts? Want to reduce your deficit, Mr Osborne? Stop your boys burning those £50 notes* ! * Or at least ask them to tell you about it! 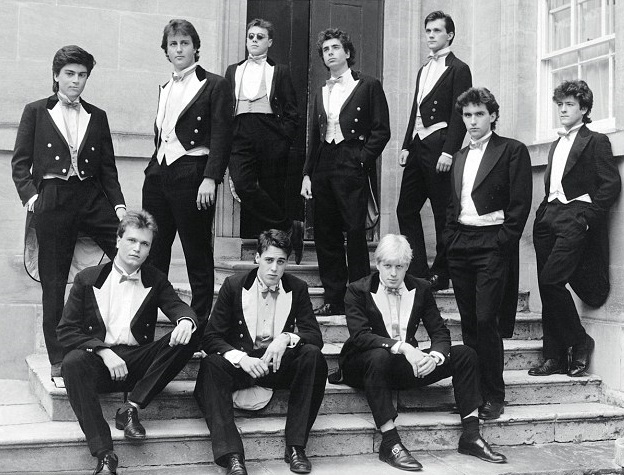 The Oxford University based Bullingdon club has attracted controversy of late, in large part due to certain unsavoury practices indulged in by its young, privileged, elitist but poorly behaved members. Their current initiation ceremony is reported to include the burning of a £50 note in front of a beggar or homeless person. A key source of worry for our worthy politicians is the UK’s government budget deficit which now runs at approximately 4% of GDP. This is the gap between what the government spends into the economy and what it receives back in taxation. The budget deficit is often referenced in support of their argument that we are all “living beyond our means”, that our “credit card is maxed out”, and that cutbacks in spending and increases in taxes are unfortunately necessary to “cut our coat according to our cloth” etc etc. So in this context, we might ask just what macroeconomic impact the burning of our currency might have? It is course illegal to deface or destroy currency. Why should that be? It does have an effect. If these wealthy young men had chosen to give £50 to a homeless person that money would no doubt have been quickly spent. It would have been a stimulus to the economy. The destruction of £50 has the opposite effect. It is exactly the same as if we had handed that £50 note over to the government in taxation, where the government routinely puts old notes through the shredder. If Mr Osborne knows of specific instances where currency has been deliberately destroyed he is quite entitled to count that as voluntary taxation. His deficit would be reduced commensurately. As he can’t know just what happens to our currency he has to assume it still exists and that it is just being saved somewhere. The net effect is still the same. To keep the economy functioning, at full capacity, any money which has been taken out of circulation either by its destruction or because it is being stored in a safe or bank account has to be respent back into the economy by government on our behalf. It’s neither here nor there whether the budget is in deficit or in surplus. We don’t need to know how much is being burnt and how much is just being stored. If any government overdoes the spending, relative to the levels of taxation, we’ll have too much inflation, but if it underdoes it , like now, we’ll have deflation and high levels of unemployment and underemployment.